If I could live in any fictional world inside a book, it would be Harry Potter’s. 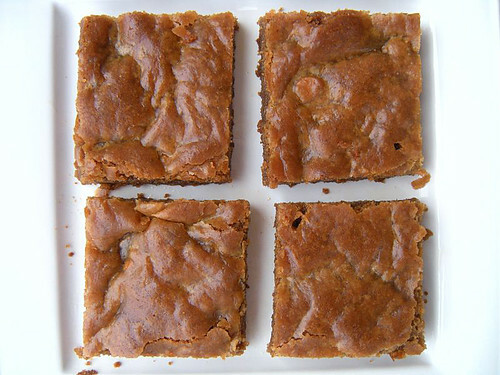 And best of all, I could have treats like pumpkin pasties, chocolate frogs that come to life if you don’t eat ’em quickly enough, cauldron cakes, and these butterbeer blondies every single day, if I so choose. And let’s face it… I choose yes. There is no definite recipe for butterbeer but butterbeer as I imagine it is a perfect blend between cream soda, butterscotch topped off with whipped cream. 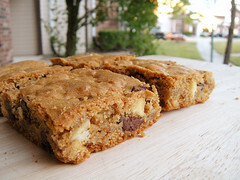 These blondies incorporate my idea of the drink into fudgy, gooey delicious bars. Line a 9×9″ baking dish with foil or parchment paper leaving extra over the sides as a sling. Spray lightly with cooking spray, set aside. 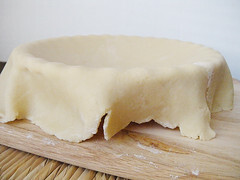 In the bowl of a stand mixer (or a large bowl with a hand mixer) cream together the butter and sugars until smooth, about 3 minutes scraping down the sides if necessary. Add in the egg and beat for one minute. Beat in the cream soda and vanilla until thoroughly mixed in. On low speed, mix in the dry ingredients just until the flour disappears. 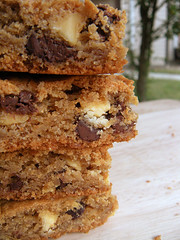 Using a rubber spatula, stir in the butterscotch chips. Spoon the batter into the dish and spread evenly. 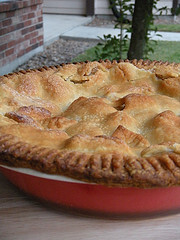 Bake for 30-35 minutes or until a knife inserted in the center comes out mostly clean and the top is golden brown. If your edges brown too quickly, loosely tent the pan with foil for the remainder of the baking time. I swear I’ve been baking along. I even have the pictures as proof!! I feel like I’ve been SO busy keeping up with the Jones’ that my blogging suffers. I’ll be posting a double whammy of a post for the next two entries to catch up and get back into your good graces. Hey, I’m trying to make amends here. You’ll forgive me, won’t you? 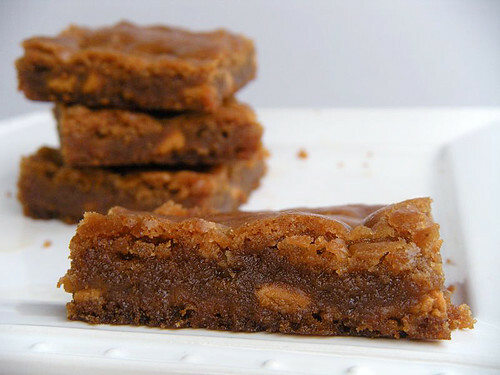 These peanuttiest blondies are darn good!! I skipped the extra peanuts, mainly because I’m lazy and I LOOOATHE chopping nuts. I also ramped up the salt to 1 tsp which gave it a nice salty edge to compliment the peanuts wonderfully. I over-baked them just a tad, so next time I’ll take them out 2-3 mins sooner so they’ll be softer. Even if the darn tester still comes out gooey. Sometimes gooey is welcomed, right? 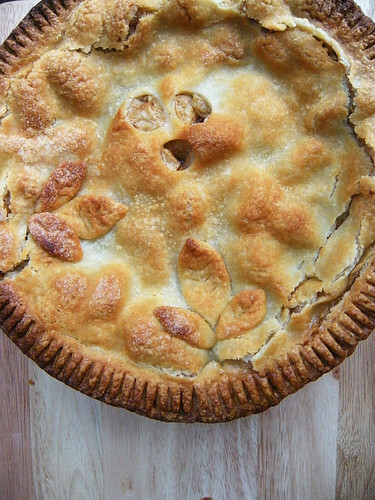 Please don’t laugh (too hard) at my pie. It won’t win any beauty contests, that’s for sure. 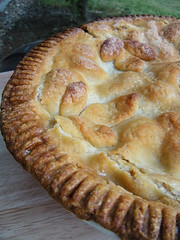 I think I may have filled the crust with too many apples and the steam holes weren’t sufficient to let enough steam out. And that means that it basically exploded a bit. But not all over my stove, thank goodness! 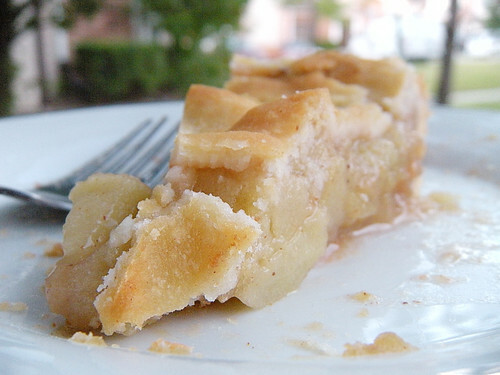 It just looks like an earthquake ravaged my pie leaving giant cracks around the perimeter. 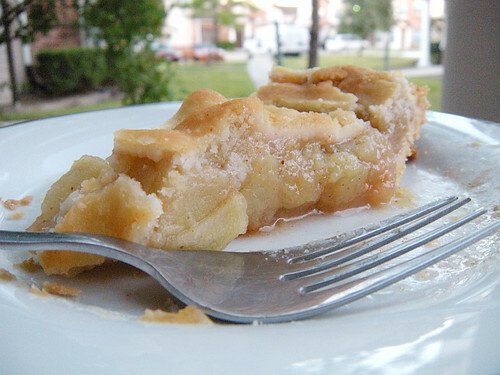 Boo for that, but lemme tell you, this pie is DELISH!! Totally helps you to ignore the cracks. Don’t believe me? I used tapioca flour instead of the pearls as I couldn’t find them (again) and it worked just fine! 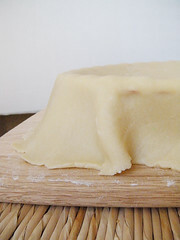 I imagine that you could sub equal amounts of corn starch or flour to thicken the filling. PS, You can’t even FIND the graham crackers… believe me, I tried!! 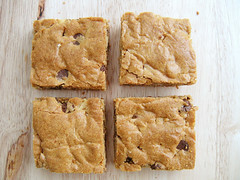 For the recipe, head on over to Emily’s blog, Sandmuffin. Or simply click here. AKA: the holy grail of all things loaded!! 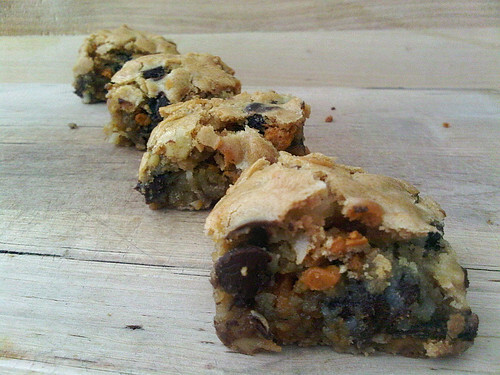 These have everything from nuts to shredded coconut to chocolate chips and even butterscotch chips in them. 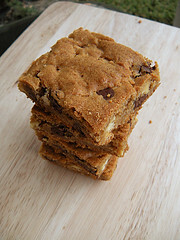 And a few glugs of bourbon may or may not have found its way into this blondie. I am not available for comment. Ahem. BOY, were these good! I have 2 handfuls of people who enjoyed them rather thoroughly. And NOOOO it wasn’t because they were boozy. My friends have more class and dignity than that. Or so they lead me to believe. But it didn’t seem like anyone really knew what a blondie WAS! I always thought that it was a vanilla version of a brownie. 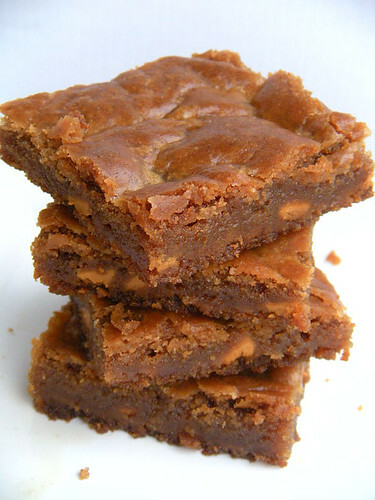 Blondie, brownie… it makes sense to me! 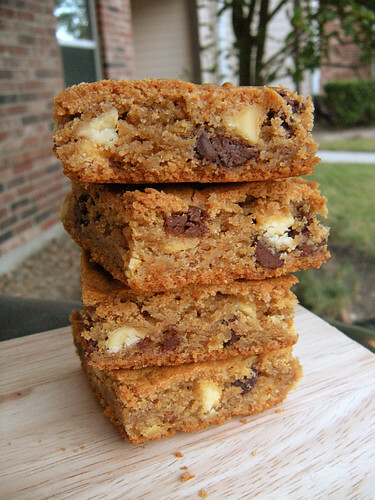 But everyone was in agreement that it was more of a cross between a brownie and a chocolate chip cookie. Who am I to argue semantics with a handful of boozy friends that were praising my treats? I’m not above that. As far as prep work goes, there’s a lot of chopping involved (unless you don’t mind hauling out the food processor) but once everything is chopped and ready to go, these are thrown together quite easily. 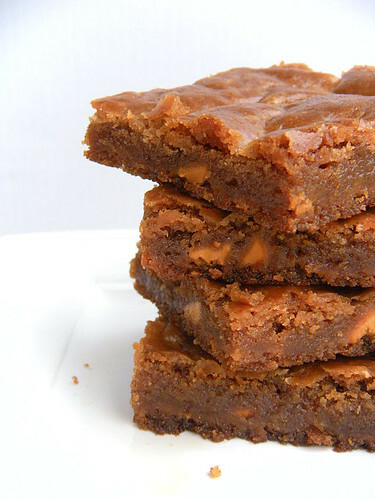 I made these and my go-to brownies (I’ll get the recipe up… eventually) in the same afternoon. 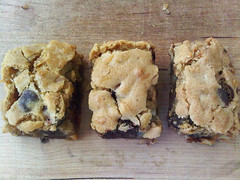 They did take a bit longer for them to bake up, probably because of the glugs of bourbon that may or may not have been in the dough, which gave them a more solid, crunchy-esque top rather than the crakled, brownie like tops I imagined seeing. Please disregard my alien looking, freakishly orange butterscotch chips. I promise they didn’t look like that the night I made them! 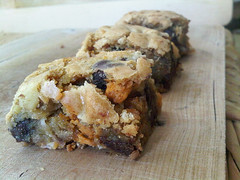 A big thanks goes out to Nicole of Cookies on Friday for choosing this recipe. 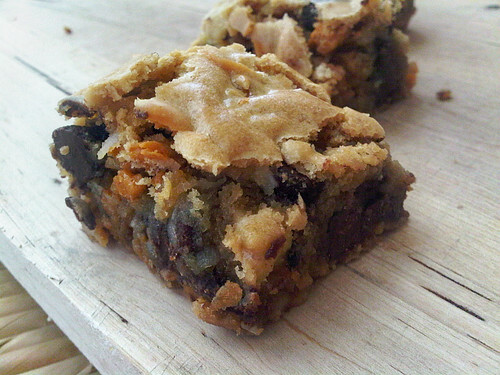 Head on over to her blog for the recipe, its a good’n!